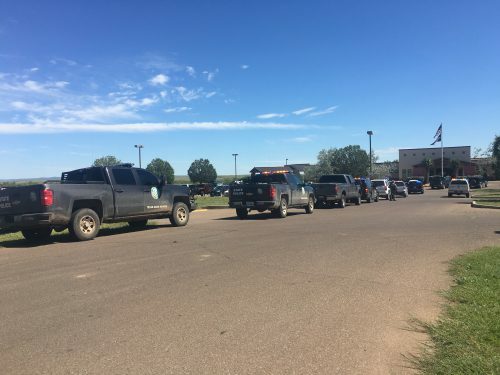 The Alpine Police Department released new details on Tuesday about the recent shooting at Alpine high school that left one student dead and one injured. In a statement yesterday, the department said the 14-year-old freshman girl who shot and injured a 17-year-old junior girl before killing herself had planned to shoot her 14-year-old stepbrother instead. Police have not released any identities in the case as an investigation continues. The department said the 17-year-old girl interrupted the planned shooting when she walked into a restroom and saw the younger girl with a gun. That’s when the younger girl started shooting and hit the older girl once in the lower body as the victim ducked and ran. The younger girl then killed herself in the restroom with a gunshot to the head. Police said the 14-year-old girl committed the shooting with a 9 mm handgun – a Kahr model CW9 – and had “only one” magazine of ammunition on hand, with a total of 18 rounds. Brewster County Sheriff Ronny Dodson had previously told reporters the girl had “plenty” of ammunition. Police said the gun was brought from the girl’s home, and that she fired a total of five rounds throughout the incident. In a separate statement released Tuesday, Alpine Police Chief Russell Scown expressed his “unyielding gratitude” to the first responders and others that dealt with the shooting. He thanked a handful of law enforcement agencies and specific officers for their “professionalism, and for their dedication to this community.” Scown also praised the faculty and leadership at Alpine I.S.D. for their response to the shooting. He thanked the students as well, in particular the victim. Scown did not elaborate on how the victim’s actions prevented a larger tragedy. This entry was posted in KRTS News and tagged Alpine High School, Alpine ISD, Alpine School Shooting, Brewster County, Crime, guns, Shooting. Bookmark the permalink.